The thunder and lightning storm woke me up and now I am stuck in an inbetweeny world where I am awake, yet the internet is broken. For some reason the interweb can’t seem to squeeze through the wires when it rains here. 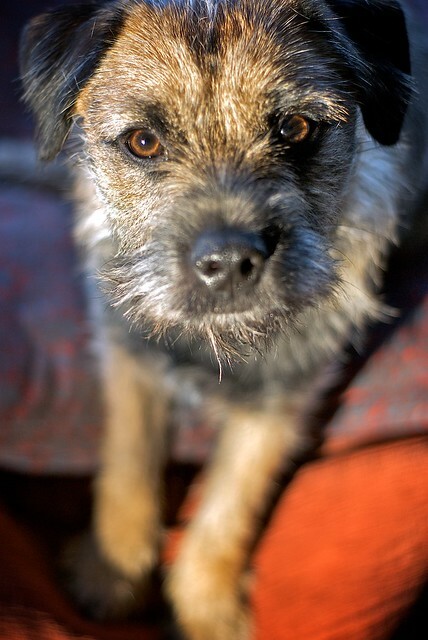 To keep me company Ernie, Border Terrier, 19 months old, is very obligingly letting me cuddle him. 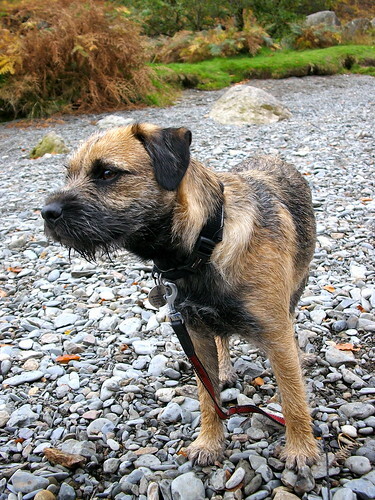 Border Terriers are like living breathing Steiff teddy bears. A bit bristly and stiff limbed, but the perfect size for a snuggle on the sofa with only the slightest coercion. He keeps us on our toes. We still worry that he will disappear when we let him off lead on walks. It’s not that he wants to run away. It’s just that he can’t resist the thrill of the chase when there are rabbits about. There are ALWAYS rabbits about around here. We live just down from Rabbit Central (it’s near Upper Badger Set and just past Squirrelsville). That said, the amount of time he is gone is tending to be a bit shorter. It’s more like 1/2 an hour now, instead of 3 or 4. He refers to the fact that we had not let him have any pets until this little puppy came along. 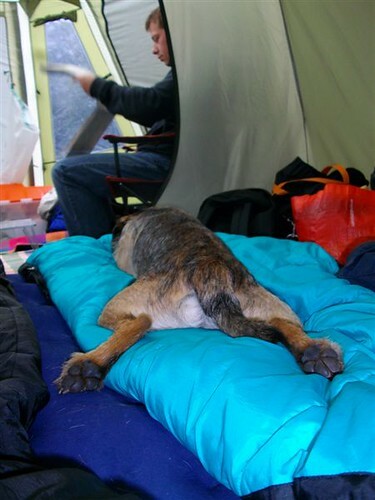 Strangely, we still find it hard to believe that we have a dog as we don’t think of ourselves as dog owning types. I guess we are now. We’re more fond of Ernie than I can tell you. I can’t imagine him not being there wagging his tail when we come through the door, or barking at the postie every morning. He is Family Member #4 and makes us laugh so often with his special ways like his constant need to sit in puddles. 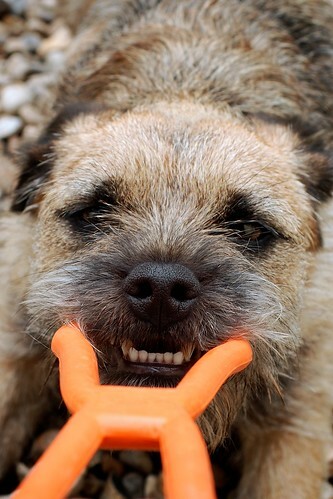 I put it on the Border Terrier Group on Flickr. 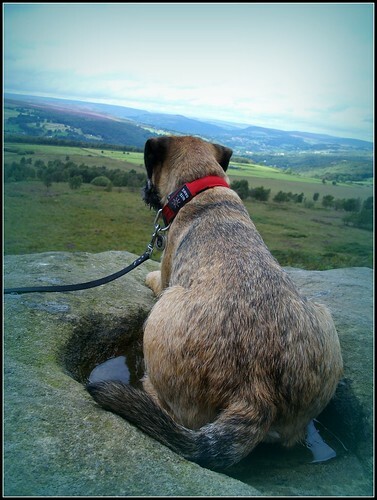 That’s where we found a lot of lovely Border Terrier friends like Tony, Ollie and Griff, and Den and Meg. Here is that list. Since I wrote it other people have added their BT’s ‘quirks’ too. I thought you might like to read it. Feel free to add any more ‘special features’ in a reply below. 7. Before barking sometimes just say ‘uff’ whilst winding up for a session. Sometimes just go ahead and make them jump. 20. After dinner why not show the humans what you would do with a lady dog, given the chance? 34. If you see a dog that the humans perceive to be bigger and scarier than you, just run right up to him and jump on his neck, no worries! Tony Sez: 36. Always check the wastebaskets for anything that has been mistakenly tossed out that is still of value. Examples include tea bags, wadded up tissue paper and dust cloths. 37. you must vigorously scratch the surface you are about to sleep on for a full 5 minutes from various angles before curling up and going to sleep! 38. Stare intently at the neighbours cat in a threatening manner even though you know you will never catch it. a) putting your front paws on the middle of their chair & poke your nose up between their legs to get a look at what they’re eating. This always makes them jump & is very funny. b) sneak up under the table, grab the visitor’s paper napkin off their lap, trot away & then shred it noisily. Gets them every time. AND, both of these make the owners look like they haven’t trained you at all! Priceless! Wait until the humans have just finished hoovering then go and find lots of sticks from the garden, bring them inside and shred them all over the carpet. 41. Wait till all is quiet and then explode into frantic barking cause you smell something not quite right. And don’t forget if you are in the pub or any other public space, lie prostrate in the middle of the floor not under anyone’s chair, humans will walk around you. 41. When your nine weeks old it is essential that you crap everywhere without exception. Then look up at the human as they have to clean it and put on your cute face so you get a cuddle for pooing on the 400 quid rug. 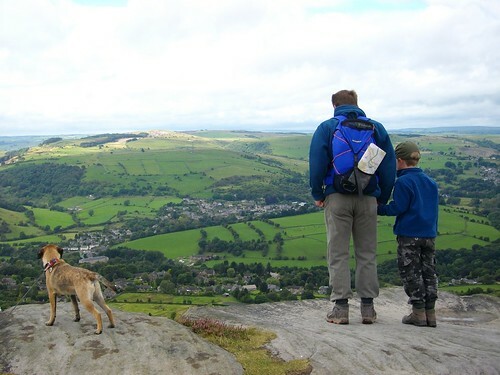 I just can’t get over how right-on this list is … ours do ALL of these things its fantastic! I can’t stop laughing! Firstly – how do you manage to take any photos that aren’t blurred while Ern is on four feet? All pics of my 2 Borders are when they are asleep! Great pics in the countryside – mine would love it but are stuck in the desert. They still manage to chase the odd hare. Can’t access Flickr where I am as blocked by government firewall but points 9,12,14,16,18,25,27,28,31,33,35 all had me nodding vigorously. Point to add: Always lick any exposed leg or arm or your owners or visitors to welcome them to the house., especially if they have nice clean feet that they have just smoothed scented body lotion onto. Lick much quicker if you are being scratched just above the tail. I went from never having owned a dog to being a Border-owner. Is there any more enthusiastic owner of a breed? It’s like entering a secret club! Hi Sally. Believe me, for every photo you see there are 20 that are a blur of fur! Consider your point added to the list!.Ern particularly likes to lick after anyone has had a bath or shower. Not sure if he wants to ‘dirty you up’ or if he just likes the taste of shower gel. Why didn’t I read this before we dog sat? We thought we’d broken Ernie when he decided to lie down on the grass mid walk until we sussed he may be too hot! Hi. I’m not normally the sort who looks through other peoples photos but I lost my 5 year old dog last month and I guess looking through the internet at pictures of cute dogs is therapy! 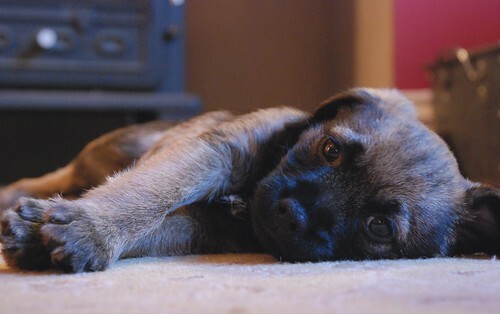 Thing is, my little fella was called Ernie (or Ern, or Ernst, or Little Ern, or The Ern, etc, etc.) and he is the spitting image of your Ern. He was actually a Parsons Russel but little things like his long arched tail with the kink in the middle always made me suspect there was a bit of Border in him somewhere. His colour and markings were almost indentical too and his mannerisms and character matched those described by you and the wonderful list. Anyway, just wanted to say how adorable he is and to thank you for a chance to maudle. Our Ern’s sudden death has left me so sad and empty. My one year old keeps posting socks through the baby-gate for him to thrash around, my 3 year old keeps asking me why we can’t go and find him and my wife prefers to get on and try not to think about it too much. That leaves me to grieve, cry and wish he was still here to stand in the middle of the garden and endlessly bark, to treat house guests like they were his personal scratching poles and to turn all walks and outings like a game of backwards tug-o-war, but most of all to sit and snuggle into my legs or arms when we stayed up for some late night film or sporting occasion. Rest in peace, Ern. I will always love you and will never forget. my border was 16 when we lost him last year, i still miss him like mad he was a wonderful dog. the wife didnt want another border because we would end up comparing them. 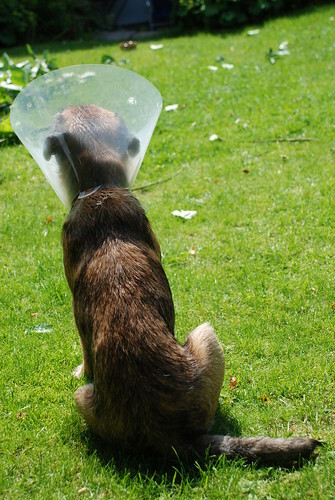 but to be honest after reading the above which i may add every point is true..we shall certainly be getting another border when my broken heart has healed.. they are such a massive dog in a small body.. Your list also applies to Australian Kelpies. Just sayin’……….. (love it!). 🙂 perhaps it’s good for just dogs in general.